Providence is located on Amtrak’s Northeast Corridor between Washington DC/New York City and Boston. High speed Acela Express train service transports passengers from New York City to Providence in about two and a half hours. The Providence Train Station is located 5 blocks (0.4 miles) from the major hotels and Rhode Island Convention Center. Boston’s Logan International Airport features nonstop air service from more than 100 worldwide destinations. Located less than 50 miles from Providence, Logan offers convenient transportation options from Boston, including bus service pick-up within steps of all five of its airport terminals. Peter Pan Bus Line’s 10 daily departures leave directly from Logan to downtown Providence, and Amtrak and commuter rail service is readily available from Boston. Peter Pan Bus Lines has flexible bus service to Boston Logan Airport 7 days a week. Coaches are equipped with WiFi, DVD players and iPOD jacks. Professional, courteous drivers will make sure you get to your flight relaxed and on time. Please be sure to choose the Downtown Providence option when booking tickets. Buses arrive and depart from the Rhode Island Convention Center. The Massachusetts Bay Transit Authority (MBTA) runs low cost commuter trains to Providence from Boston and other points in Massachusetts. Call 1-800-392-6100 or visit www.MBTA.com for schedules and fares. Regional trains take 48 minutes and range in price from $12.00 – $19.00. Amtrak offers many daily runs between South Station and Providence. Amtrak ranges from $22.00 – $45.00 and takes 40 minutes. Schedules and fares can be accessed at www.amtrak.com. South Station may be accessed from Logan Airport by either Silver Line Shuttle or Taxi. The Silver Line service takes approximately twenty minutes. An adult fare is $1.25. A taxi will cost about $15.00 and will take about 10 minutes. 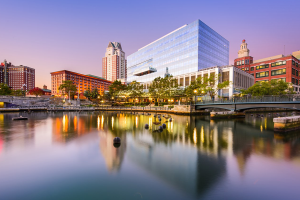 For those flying into Rhode Island, Green International Airport (PVD) is only 10 minutes from downtown Providence, and is conveniently located right off of Interstate 95. A favorite of business and leisure travelers, Green was named the third best airport in the U.S., as well as best in New England in the Condé Nast Traveler 2015 Readers’ Choice Awards. Green features up to 100 nonstop flights daily via major carriers. Green’s eco-friendly InterLink hub provides passengers with an array of transportation options. Conveniently housing a rental car facility, public transportation options and rail service to Providence, the InterLink offers travelers ease, affordability and accessibility. For more information, visit pvdairport.com or call 888-268-7222. Taxi service: Taxi service to and from T.F Green Airport into Providence cost approximately $35.00, plus gratuity. Uber: Cost is approximately $15.00 – $17.00. The designated pick-up area for Uber is within Garage C, just a short walk from the Arrivals/Baggage Claim area of the terminal. Lyft (please note the airport promotes Lyft as the only ride share service): Cost is approximately $15.00 – $17.00. The designated pick-up area is located on the outer arrivals roadway along the purple colored curb, located directly outside the Arrivals/Baggage Claim area of the terminal. T.F. Green Airport is conveniently connected to the MBTA commuter trains through the InterLink train station. Travelers can access the InterLink directly from the airport terminal through the skywalk. To get to the skywalk, proceed down the elevators to the ground level and walk to the far front left of the terminal, past the Visitor Information table, and look for signs directing to the InterLink connector. Train fares and schedules can be found on the MBTA website. The 4th floor of the North garage is connected to the Omni Hotel. To enter the North garage, continue past the Omni entrance, through the tunnel and the entrance will be your right. Daily Event Rate, $15.00: The Rhode Island Convention Center garage charges a flat daily rate of $15.00 when an event is in progress. Enter facility at or after 7:00AM and exit by midnight. Otherwise, hourly rates apply. No in/out access privileges apply. Overnight Rate, $20.00: Overnight Rate increments to a maximum of $20.00 per each 24-hour period. Facility is open 24/7. No in and out access apply. Located at the intersection of I-95 and I-195, Providence is 50 miles from Boston (about a one hour car ride) and 185 miles from New York City (about three hours by car). For a detailed map of the area, please visit our website at GoProvidence.com. Massport Shuttle Buses serve all terminals at approximately 10 minute intervals, Massport shuttle buses are wheelchair lift-equipped. They also serve the MBTA Airport Station, Logan Water Shuttle dock and Economy Parking. Buses are equipped with a visual and audio stop announcement system. Distances from curbside drop off areas to airline ticket counters vary from 50 – 200 feet. Curbside skycap services are available from most airlines. *All taxi’s departing Logan are charged an additional fee of $2.00, plus a $4.50 fee for harbor tunnel crossings. Always ask driver for a receipt.